Find Great Exuma Real Estate in the Bahamas below! Great Exuma lies at the end of a 100 mile string of Exuma islands and islets that run from northwest to southeast. 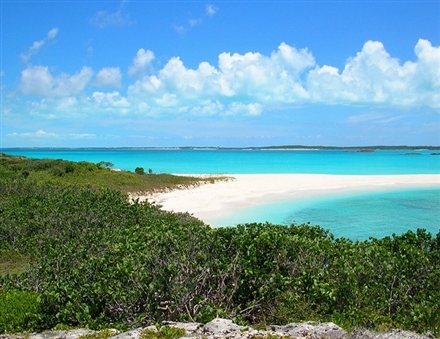 Great Exuma real estate is in high demand and found dotted along gorgeous beachfronts and coves. George Town, the largest settlement, is a small bustling tourism and shipping port that helps keep Great Exuma properties in such high demand. Great Exuma is home to two major yachting events, the Annual Family Island Regatta and the Annual Georgetown Sailing Regatta held every March. During the Regatta, the population of the town easily doubles with visitors from Nassau and all over the world. View Great Exuma real estate or read more about some of Great Exuma's private islands below. The homes for sale in Great Exuma offer stunning views whether they are waterfront homes, hilltop homes or oceanfront property. Great Exuma is the place to look for secluded beachfront and private islands like Stocking Island and Little Exuma. "The Ferry", to the south, is actually a long vehicular causeway linking the mainland to the island of Little Exuma. The Tropic of Cancer runs directly through George Town hence the name of one of the town's beaches, Tropic of Cancer beach. Approximately 900 people live in this scenic seaport, a favorite spot for yachters. Mosstown airport services Great Exuma with its own control tower and paved runway, able to accommodate any type of aircraft. If you're interested in private island real estate in the Bahamas, at Dupuch real estate we can show you what's available on and off the market, get in touch, today!